Picadillo is a dish with ground beef, tomato sauce and vegetables and it can vary greatly from one country to another. My version of picadillo isn’t based on any one authentic recipe. This is a very easy recipe to make. 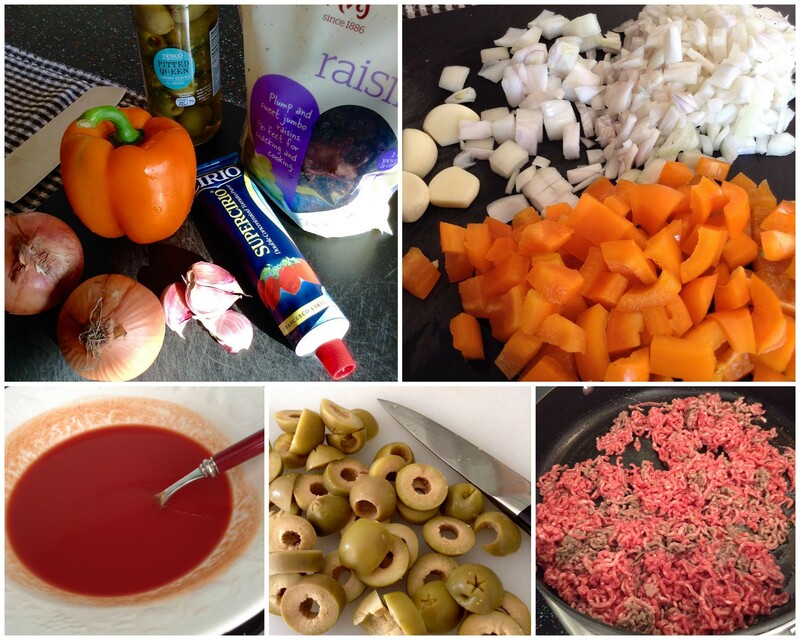 The bulk of the work entails chopping a few ingredients… the word picadillo is derived from the Spanish verb “picar”, which means “to chop”. I love the contrasting flavours in this dish… tangy olives and sweet raisins. The onions and peppers provide texture and colour. 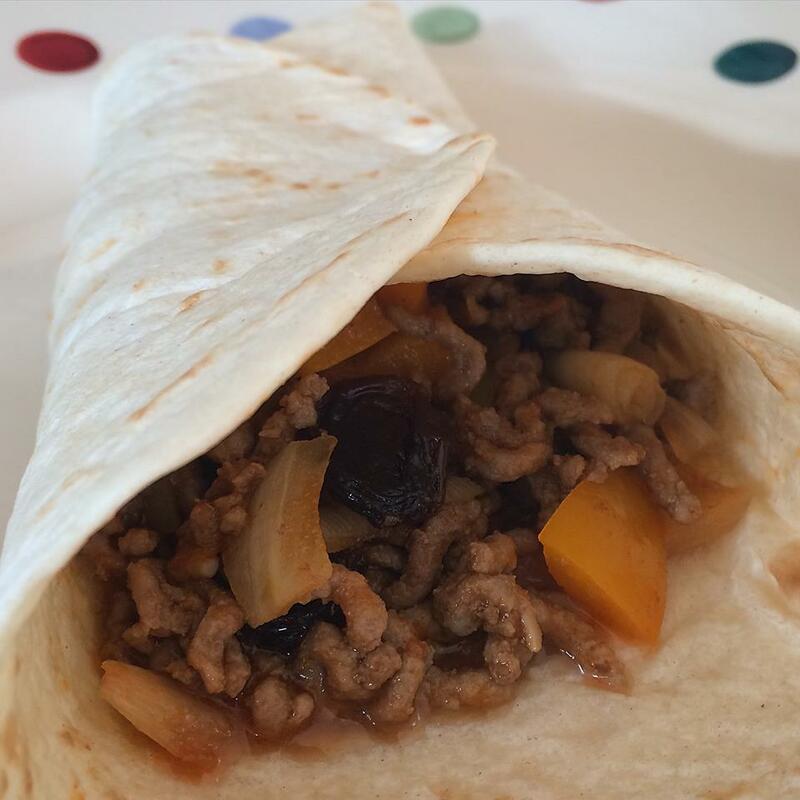 I like to wrap the picadillo in soft tortillas but for more crunch, tacos can be used as well. The recipe calls for tomato purée to be mixed with water. Tomato sauce (1-¾ cups) can be substituted for the tomato purée but it will be much higher in sodium, so don’t add salt at the end. Mix the tomato purée with water in a large bowl. Set aside. 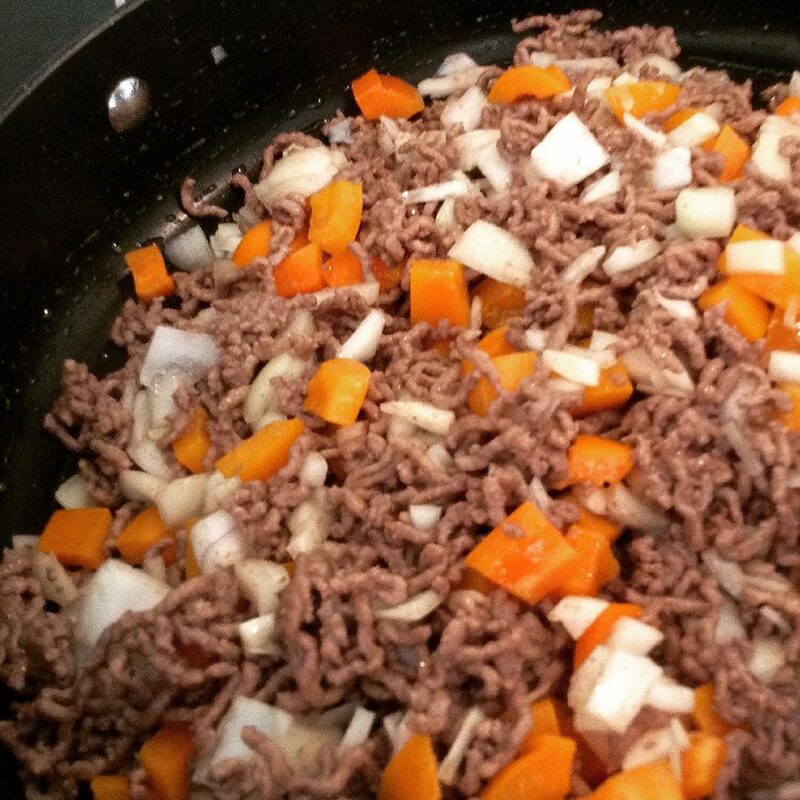 In a large non-stick skillet, cook the ground beef until browned. Drain off any fat. Add onions, peppers and garlic. Cook, stirring often, until onions are softened, about 7 minutes. Stir in the tomato paste/water mixture. Add the raisins, green olives and Worcestershire sauce. Simmer for 5 minutes to reduce liquid and blend flavours. Stir in the red wine vinegar and sprinkle with salt and pepper. 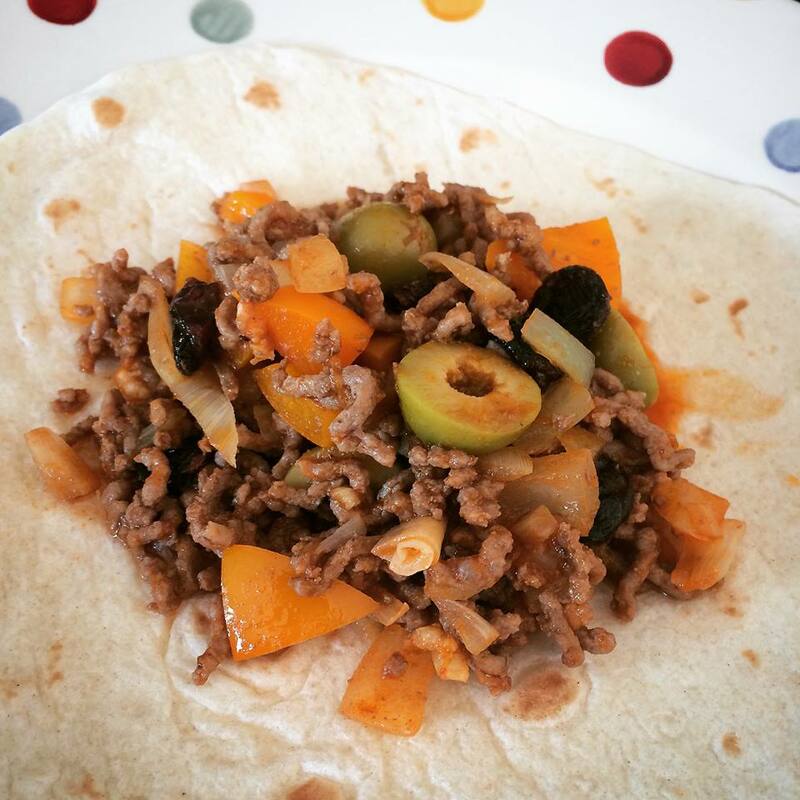 To serve, spoon picadillo into a tortilla. To wrap, fold both sides of the tortilla over the filling towards the centre then fold the bottom. Hold firmly. Don’t overfill or it will fall apart when you pick it up. Makes 4 servings. Enjoy… can I get an “olé”? This entry was posted in Our Kitchen and tagged green olives, green peppers, ground beef, onions, picadillo, raisins, red wine vinegar, tacos, tomato puree, tortilla, Worcestershire sauce, wrap by One Two Culinary Stew. Bookmark the permalink. 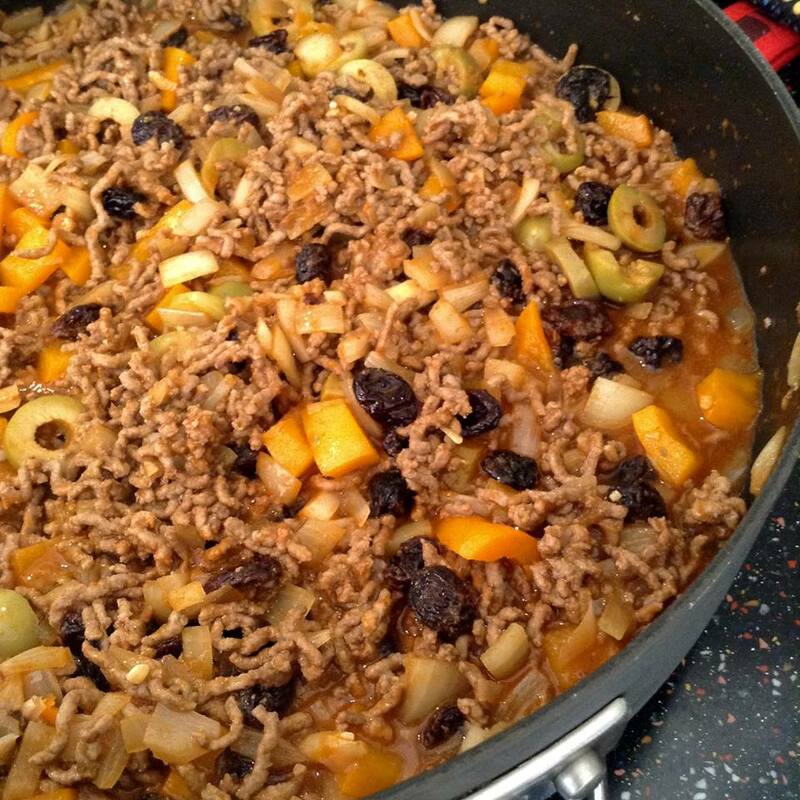 I haven’t made Picadillo in years, great idea to serve on tortilla, I used to serve it over rice.